reviewed for their use and consumption. To encourage the development of products and programs specifically suited for diabetics and their needs. Participate where necessary in developing network of educators, medical facilities, and resources for diabetics. of Approval they can depend upon. Must meet the highest acceptable quality, safety, and effectiveness for diabetes. resources for diabetics, non-diabetics and health care providers. are comprehensive, simple to use and easy to understand. consider the emotional, medical, physical, and psychological aspects of diabetes. are dedicated to research and product development. emphasize stress control and relaxation. provide unconditional care and acceptance. 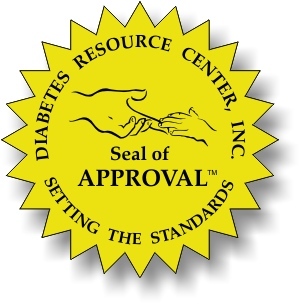 Diabetes Resource Center regarding our Seal of Approval program.